MIDDLE OF NOWHERE, BRITISH COLUMBIA — If you have always wanted to spend the night in a treehouse, welcome to your dream hotel. My husband surprised me with two nights at Outa-the-Woods, a treehouse with luxury accommodations southeast of Cranbook in the shadow of the British Columbia Rockies. Even after being greeted by the lovely llamas as we drove up we still were not prepared for the beauty of this place in the Mayook Valley, about 100 kilometres west of the Alberta border. It is tucked way back in the bush so one would never know it existed. Built on a platform five metres (16 feet) off the ground on seven trees, the treehouse hangs above you in all its carved beauty. Mike Zamara and his wife, Debbie Lungal Zamara, built the treehouse for adults after their children had so much fun playing in a smaller, more traditional version. Mike Zamara, a transplant from Toronto, said he didn’t know anything about making treehouses before he took up the project. With the help of friends, he built the 16-by-20-foot, two-storey structure over four years. It was completed in 2005 and has been welcoming guests since. “All you see is a mountain view. It’s in a thick forest with a lake to one side and a pond below with trout jumping out of it. It’s meant to give a back-to-nature feel for guests,” he said. A moose and her calves are among the wildlife you will see on a visit, along with the possibility of cougars, bears, and elk. The real charms, though, are what’s inside the treehouse. Filled with character wood, it features a propane fireplace, a full kitchen, three-piece bath, and private loft with queen bed and separate balcony. There is also an extra queen futon on the first floor. The main balcony, beautifully adorned with carvings everywhere in the burled wood, is a perfect spot to look out at the Rockies while sipping wine in the evening or during a morning meditation. There are two spiral staircases and stained glass thrown in for good measure. Shouldn’t every treehouse have stained glass? The structure, which is on the Zamaras 160-acre property in the community of Wardner, is totally off-grid, with power coming from geothermal and solar sources. Water is pumped up from a well and the toilet flushes to a compost. Exceptionally rigid, the treehouse is protected from the threat of high winds. Mike Zamara built the treehouse with a deep-rooted arbutus tree in front to help protect from the wind and there is now also a steel girder on one side of the building to add more support. The spruce exterior includes 2-by-6-foot beams, rather than 2-by-4, and the treehouse is also insulated. “It is unusual. We came up with the idea because we thought, wouldn’t it be great to build one of these for big kids? It does come with all the comforts of home,” said Debbie Lungal Zamara. The Zamaras say they are fully booked for their season, which runs from April to November each year. They also have no plans to add any more treehouses, but they do have a winterized log cabin that allows access to the many kilometres of cross-country ski trails in the East Kootenay region. One of the most unique properties in Canada, the Outa-the-Woods treehouse is being considered for a spot on an England-based TV show about unusual hotel rooms. It’s certainly a place I will never forget. And it’s a mere $150 per night. We will definitely return the next time we are anywhere near. More Info: The treehouse sleeps a maximum of four people and there is a $25 charge for towels and linens per couple. There is a 50% security deposit on all bookings. Getting There by Car: From Cranbook, head southeast on Highway 3 (Crowsnest Highway) and turn right onto Wardner Road. Take the first right onto Ha Ha Creek Road and then a slight left onto Lang Road. The drive covers about 35 kilometres. 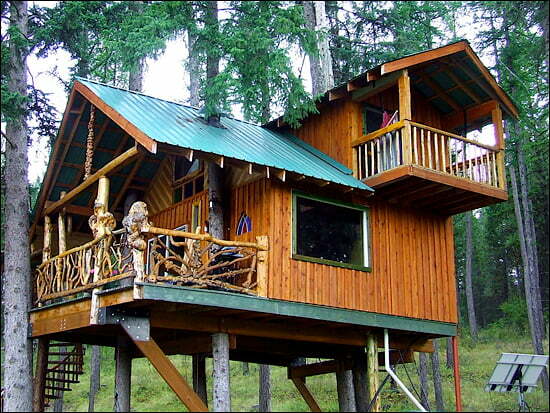 Guests can drive right up to the base of the treehouse, which is one kilometre from the Zamaras’ house. Terry is an award-winning photographer and world traveller. Having lived in Michigan and Colorado, Terry is now based in Toronto and contributing her talents to Vacay.ca. She has been photographing since she was nine years old and continues to pursue her passion for telling stories through her lens. Among her favourite places in Canada are Banff, Ottawa and the Toronto islands.